There's a simple principle for optimizing any kind of landing page: make only one offer on the page. Keep everything focused on that one conversion goal you want to lead your visitors to. But in the real world, things often aren't that simple. Many businesses have multiple offers. Possibly even for multiple, highly diverse target groups. If this is the case, how can you create a good homepage that advertises all your offers without confusing visitors? That's what we'll discover in today's website review. The website in today's review is Jason Carthen Enterprises. Jason is a former professional football player who now offers consulting and coaching services. As you can see, the treatment page isn't only different, it's also shorter. That doesn't mean a shorter page is always better, though. In this case, we've rebuilt the page based on a simple idea: make it easy for visitors to get to the right page. People's attention spans are limited. Our brains are keenly optimized to sort through a lot of information and find out what is relevant to us (at its very basic: "Is this a danger to me? Will this help me survive and thrive?"). This is why trying to appeal to 3 totally different target groups on one single page just won't work. If we look at Jason Carthen's homepage, any part that appeals to an event manager will turn off the Fortune 500 HR director and the individual dreaming of starting her own business. The page we reviewed is, in fact, trying to keep all 3 of these people interested. And because that's almost impossible to do, most people will feel like the page isn't relevant to them and won't end up buying and of the products or services on offer. Does the same problem apply to your website? If you have more than one product to sell, it probably does. If you have more than one type of ideal customer you're trying to sell to, it probably does. And if there's more than one thing you want visitors to do (buy something, subscribe to your newsletter, share on social media...), it probably does, too. The issue this leads to is excessive signaling on your website.​ That's when your site is sending a lot of different signals, each one saying "do this! ", "pay attention to that! ", "don't forget this!" - all at the same time. Are you already getting a steady stream of customers and clients from your website? If not, the best solution is to narrow your focus. It's much more effective to start with one core offer and one ideal customer. You can then optimize your website and your marketing strategy for that. It means you have fewer pages to create, test and maintain. And it means you have a clearer focus for your ​content marketing, PPC ads and any other marketing material you create. ​If you already get a steady stream of business, adding more offers for more target groups can be a good idea. In this case, the solution to avoid excessive signaling is to create specific landing pages for each offer and for each target group. A clear and easy path for visitors to "self segment", as we showed in the video. Quizzes are extremely engaging. Meaning: if you show people a quiz, the majority of them will interact with it. That means you can show your visitors a super relevant offer that fits them like a glove. And in general, the more relevant and offer, the higher your conversion rates will be. What are your thoughts about this website review? Do you have further suggestions or other ideas about how the site could be improved? Let me know by leaving a comment! Love this – thanks for sharing. Thanks for your comment, Matthias! Great teaching, Shane! These are principles you have shared with us over and over. Offering an example makes it so much easier to understand. This is great! Thanks for your comment, Darryl. Yes, I agree that this applies very well to service based businesses. About the “for whom” part: I agree that this is important to address. The reason our treatment is the way it is, is because there are too many “whoms” that this site is for. The idea here is that above the fold, you advertise the man (the personal brand) and the “for whom” comes right after that, in the self segmentation part. But of course, I’m not saying that our example is the perfect one. The only way to arrive at anything close to optimal would be through lots of testing. What a fantastic make-over and a clear explanation of the “why & how” so others can apply the principles to their site! Thank you for your comment, Randal! Happy to know that you found it useful. Such great advice, Shane! The original seems to scream desperation! Your remake is much more compelling and not at all confusing to the visitor. I hope they implement your suggestions. Thank you, Tami! I’m glad you liked this post. And I think you make a good point: the excessive signaling can seem a bit desperate. Yet another good reason to keep things clean and simple. This is such a timely post. Going through this process for three different websites. Thank you! Question. Since the navigation, dropdowns, etc were removed do you include them on the internal pages instead? I do like the idea of less on the home page. First, I would ask myself: are all these pages necessary? Are all of them useful and effective for my website? When I see sites with 15+ navigation items, in most cases I bet most of those pages barely get any traffic. Or maybe they do get traffic, but they don’t convert any visitors. In that case, why clutter up your menu with them? But that’s not to say that you should just get rid of all your pages. I think it’s also important to keep in mind that not every page needs to be directly accessible through your navigation. Some pages make more sense if the visitor comes across them organically. Here’s an example of such a page on our site. This is a page you cannot reach directly through the site navigation. 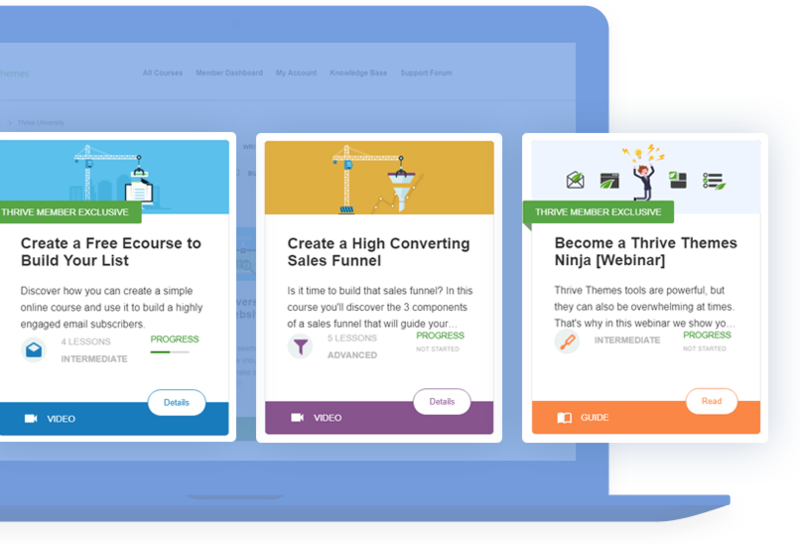 But if someone gets interested in Thrive Leads, then wants to learn more about its features and then wants to learn more about this specific feature, they will find links and buttons in our pages and content that leads them here. They organically follow the rabbit hole to this page, if they are interested in this specific thing. A secondary benefit is that pages like this can attract search traffic as well. But if we tried to add every page like this we have to our navigation, it would be a huge mess. Another thing I quite like on some sites is a footer area with more links to some of the secondary pages. Great points, Shane. So those pages would be “discoverable” and like the footer idea as well. Thanks, Shane! I offer four software products in my website. It’s not cluttered, but I’m sure it could be improved. I would love if your team could give me a critique. I’m sure that you guys would identify some issues immediately. Do you offer such a service (I would pay for it of course)? Thank you for your comment and your offer! We don’t do this as a paid service. However, if you are a Thrive Member, you can submit your site here for a chance to have it reviewed in the future. Touchdown! Jason is surely cartwheeling this assisted victory. Very nice Shane. Great insight. I work with attorneys and was always looking for this kind of advice. Attorneys practice multiple areas of business and they have many practice areas. That’s a good example, yeah. I think a lot of service based businesses can face this problem, because they know they can serve many different people under many different circumstances. Excellent. Though I knew all this, am reminded that it’s not what you know that counts, but what you do. These pearls will definitely will shine when I relaunch my site, and provide me another much-needed nudge to finish my book and get the new site up! I’m happy to hear this was a good reminder for you, Joe. Good luck with your book launch! Great review Shane. Is there a point where there are too many segments to choose from on a homepage? 3? 4?… at that point, should the brand have additional websites? That’s a good question, Randy. I don’t think there are any clear cut rules about this. If you look at ecommerce, there are stores with a huge range of products for a huge range of audiences. The key there is really good categorization, search and personalization. For example, Amazon makes sure that it does end up showing you only stuff that’s relevant to you, even though they have a billion products available. That’s the extreme end of many offers for many people. Even Amazon started out just selling books. So, my general advice would be that you start out simple and you scale up to more products and more target customers slowly. I’m guilty of this. My clients are guilty of this. It’s a good perspective that shows it very clearly. I know, right? It’s so easy to fall into the trap of trying to appeal to too many people all at once. I was just starting to do this on my own to eliminate some unneeded monthly services. Always great stuff just when I need it, Awesome! Great to know that this was useful for you, Robert! great review – can you further divide you blog entries by audience purpose? Or would this be achieved by blog categories? The way to achieve this would be via blog categories, yes. I think that’s a basic and practical content marketing approach: have one category per target group or product that you sell. Hi Shane, I have a similar problem to this and this has helped me a great deal. Thank you. I’m very happy to hear that, Steven! Great makeover! Do you guys usually send a message to the person whose website you “critiqued”? I think Jason could really benefit from this one. Thank you, Lynne! Yes, we usually send an email letting them know we’ve published a review. Your suggestion to have visitors self-segment not only solves the problem of excessive-signal confusion, it also creates an invitation for the visitor to engage with the site. That generates a micro-commitment that leads to additional larger commitments. Now the visitor has moved past the “what do I do now mode” into a the “yes, please” mode. Yes, that’s a great point, Phil! It gives the visitor some agency and the micro commitment effect can be really useful, here. Oh.. I didn’t realise I pushed send on my initial comment. I wanted to add that I tweaked my homepage because of this video. Your reminders are always appreciated, Shane. Shane thanks again this couldn’t be more timely for me. Can you tell us which of the thrive themes the team used to build the new homepage? None of our themes look like that out of the box. I would probably use the Rise theme, with some small changes to fonts and colors, and build this from scratch on a full width layout. I’m a custom jewellery designer and through keyword research am finding multiple “niches” that I can apply this segmentation strategy to. Thanks! We’re working hard to make all of our blog posts and emails really worthwhile. Brilliant. Keep it simple, clear, easy to choose. Less is more. Would you add a Content Upgrade to this post, for Thrive Members, so we can download the page template? That would greatly speed up implementation of this design into our website. For an example, see your prior post, “Upside Down Homepage Step by Step + Free Template”. Since what we’re discussing here is an existing user’s website and brand, it wouldn’t be nice of us to make our design available as a template. When we build new landing pages from scratch, we’re happy to share the templates, but for website reviews, we won’t do that out of respect for the people who submit their sites for us to review. This post here is more about the general principles that you can apply to your site, rather than copying a design 1:1. Thanks for your comment. The general answer is that for your visitor, it should never look or feel like they are switching from one platform to another. They should never notice a transition, even if they’re going from WordPress to Shopify or from a domain to a subdomain. Perfect timing for this message – as I start on another site. Thanks for the tips! Thanks for your comment, Tony! Glad you liked this post! That’s great Shane and makes a lot of sense for the home page. :) But I wonder how you would structure blog/article pages for a website that has a lot of content to attract SEO traffic. How do you get people to engage in the content and come back without overwhelming the home and other pages? A page that has the purpose of attracting SEO traffic should also be focused. The same “rule” applies: don’t try to make a page that will rank for 15 different keywords, because it will end up ranking for none. Instead, you should have one page for each keyword. There’s nothing wrong with having long pages with lots of content. It’s about the focus of that content. Having a page focused around 1 keyword is better for SEO. And having a page focused on one specific type of user, one use case or one specific product/service is better for keeping readers engaged. Ha!! Just tackling this very issue today on our site. Great timing, great info. Thanks Shane. Glad to be of service, Graeme! What about the UX that Google pays attention to in its latest algorithms? If you quickly move people off of the home page, is that not going to hurt it’s “time on page” (therefore lessen Google’s perception of it’s “page utility”)? BTW, great video with solid, implementable ideas. 1) The measure of a page’s utility is in whether someone bounces back to the search results or not. As far as I know, there is no downside to sending people further along your site, quickly. 2) If you want people to stick around on the page longer, you could use a quiz. Quizzes are amazing for getting people to interact and stick around. 3) Personally, I don’t care in the least. If I make a change to my site that makes the site better for my human visitors and increases my conversions, then I don’t give a damn whether a Google algorithm favors the change or not. Thank you. Clear and structured, “Less, but better” Dieter Rams, Braun Design. It is heartwarming how you get things to the point. Yes, I do agree that the original website is trying to do a”one size fits all” thingy. May I say that if we add a CTA for an opt-in above the fold would be ideal before the visitors scroll down further to the three multiple choices? I am trying to build this screen filler myself but not so successful. Could you please provide a template for this? I could not see anything similar in the TCB or cloud template. Thank you for your comment, Albert! Having a call to action “above the fold” may or may not be helpful, yes. It’s something you’d have to test. For the opt-in form we’re using, we don’t have a template yet. We are currently not releasing new templates until Thrive Content Builder 2.0 is released. But we’ll keep it in mind for when we’re ready to release new ones. Hi shane How could I write in a single blog for two different segments. There are post that are the same for both, for example: a review of your services thrive themes. Honestly keeping two blogs is not so easy and I would not like to write twice the same article, one for each blog. you understand me? Thank you for your question, Alejandro! I would not recommend writing the same content multiple times. Neither do I recommend having multiple blogs. Instead, have multiple categories on your blog and make it easy for visitors to find posts on the topics they are most interested in. For your example of reviewing Thrive Themes: it would make sense to have a general review of our products, covering everything in detail. However, you have to realize that this won’t appeal to many people. So, in addition, you could create some content about “How to Use Thrive Themes for Your Freelance Design Business” or “How to Get More Testimonials for Your Private Clinic (Thrive Ovation)” or “How to Optimize Your Blog With Thrive Leads” and so on. Each segment of your audience is interested in different things, wants to see different use cases, etc. In your more focused posts, you can still link to your general review, for people who want to learn more. That’s great to hear, Justin! Good luck with your new site! Great topic, as I think this is a **very** common dilemma with many businesses! And, another great breakdown and analysis + solutions. It’s so helpful to have optional soltuions because nothing is ever “one size fits all!” ;-) For me personally, I different readers (prospects) coming in for different solutions, like you’ve described here, and the “self-segmentation” is brilliant!. I’ve been planning on doing that but wasn’t sure how to direct them from the Home page, so this website review is perfectly timed for me! Fantastic discussion on how to present all you do to fewer people – services segmentation. We all know that we should segment our offers. As well, as a doctor offering alternative solutions to health problems I have been told many times I do too much. Well, maybe, but it all works and I want to tell people about the treatments I offer. I know it can be confusing. Shane’s discussion in this post gave me concrete solutions to my problem. Thanks, just what I needed today! Thank you for your comment, David! I hope you can find a way to test this out in your own business as well. Thanks for this. Off to redesign my homepage. Glad to know you can put this to use right away, Kara! Great content as always. Love your work! Greetings from Japan. I work with clients in Tokyo, and I see this problem all the time. So I really like the idea of users “self segmenting” as early as possible in the home page. I recommend this technique all the time. I like your treatment a lot — and the comments to explain why each block is there. Good job guys! Hi Shane, Excellent to-the-point content once again. Thank you. I need to revisit my home page again with the critical filter you offer. ‘Excessive signalling’ becomes noise, something I teach about in stakeholder engagement, so I think I’m in danger of modelling poor practice from the outset. I like your approach here. Just a brief question: Did you build the site complete “frameless” in the Thrive Content Builder? Or is it based on a Thrive theme? Thank you for this great makeover! I love, love, love all your teaching videos. Despite I’m online since 1993 I can always learn more. Your approach to teaching is really great. It’s understandable and interesting at the same time. I’m a great fan for all of these excellent critiques — especially since they highlight all of your great products…! I am curious — have you tracked any of the website reviews and see if they have modified the site along the lines of your recommendations? Maybe they aren’t “everything” you’ve recommended, but taken the ideas and changed the site? I’ve gone to Jason’s site like 3 times since this came out and nothing has changed there — and this review was a powerful implementation of creating more conversions. To be fair, if it is a website designer, maybe three weeks isn’t enough time. I’m just curious how many websites have been led to the water, but haven’t taken the drink :) And if they have — how has it improved the site? Maybe do a ‘website makeover revisit’ to learn of the updates and successes. (More super content for you to deliver!). Thanks for doing these; they continue to extremely useful. Hi Scot, thanks for this question and I’m glad that you brought it up.. I actually did not receive any notice the review was completed. I am excited about what Shane suggested and look forward to a simple design going forward. Thanks again for your comment! Hey Shane! This is a great artcle and very on point for me. I do have one question though, where did you get the icons used in the get started here section? I know you’ve had postes where you give resources, but those ones ae really nice! Thank you for the great work you guys do at Thrive Themes! This is great and exactly what I have been struggling with on my site! I can’t wait to implement some of these ideas! Hello! Great video!!! So when you have the “get started here” sections, those go directly to a landing page? Should that landing page be for a tripwire or low cost product to get the user into buy mode? What I have been doing is linking those sections to sort of a resource dump (blog articles, videos, etc)… but the pages lack a CTA. Thanks, I learned a lot! Would you mind sharing actual samples of this kind of website, the correct one? Great stuff, I am a digital marketing consultant and it’s funny what they say, the doctor can’t always find a cure to their own issues, but can help cure others lol. I am in the stage of my business where we have steady monthly clients and nice blog traffic coming in and I knew I had to narrow the information I was providing my visitors, but you spelled it out so well in the article that now I know how and where to direct myself.